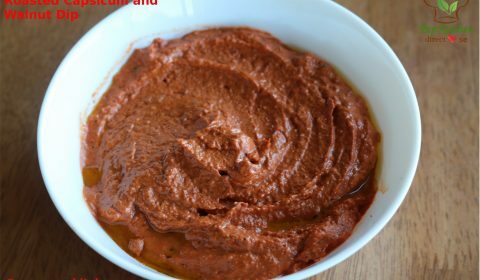 Roasted capsicum and walnut dip (Muhammara) is a traditional Middle Eastern dip made with roasted red capsicum, walnuts, garlic and olive oil. 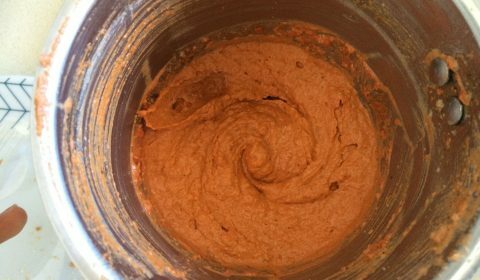 The pomegranate powder (anardana powder) adds a unique tangy taste to the dip. The rich red color dip is healthy and can be enjoyed with chopped veggies, pita bread, lavash or falafel. 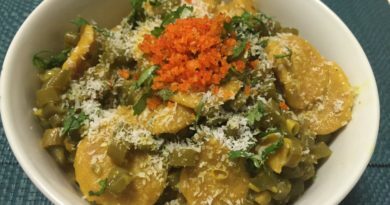 It is vegan. I have used bread to get the thick consistency of the dip. For a more healthier version you can use roasted quick oats to make the dip. This also makes the dip gluten free. 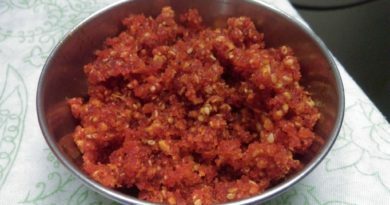 In the place of anardana powder, you can use pomegranate molasses that is readily available in the supermarkets. 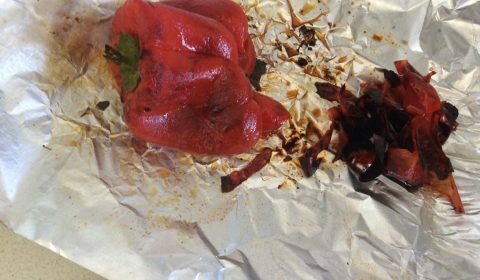 Wash and pierce the red capsicum with a fork. Place them on a baking tray lined with baking paper. 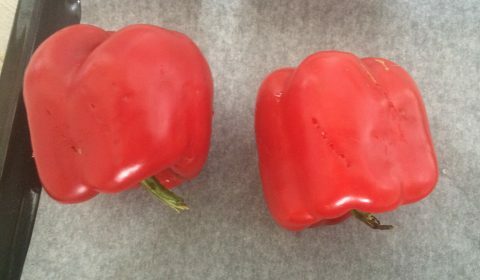 Bake the capsicum at 200 C for 10-12 minutes or till the skin blackens. 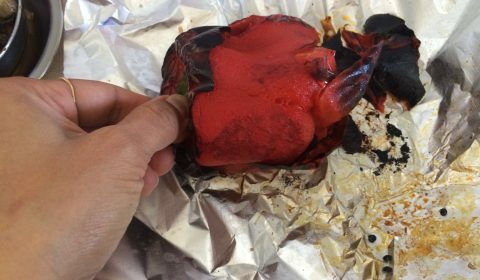 Alternatively, you can roast the capsicum on the flame of the gas stove. Move the capsicum over the flame till the skin blackens. Remove and cool the capsicum. Peel off the charred skin. 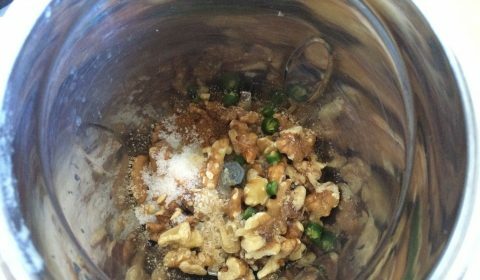 In a mixture jar, add chopped walnuts, green chili, sugar, and salt. Pulse till the walnuts are ground to powder. 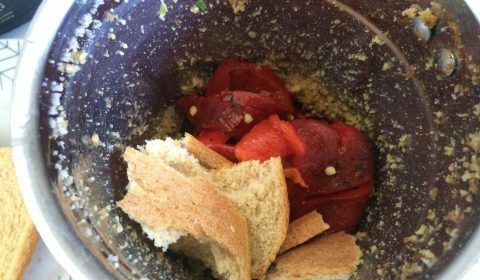 Now add the roasted and peeled red capsicum and bread slice. 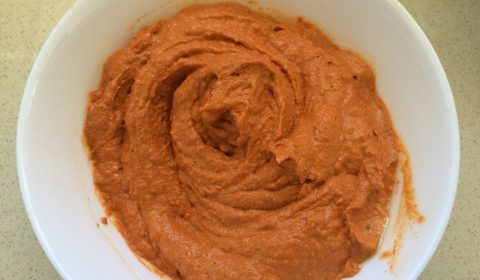 Blend them to smooth paste. Add anardana powder, 1 tbsp water, and 4 tsp olive oil. 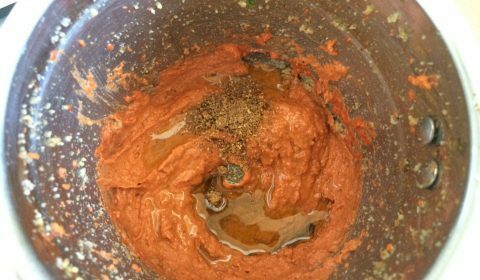 Blend them to a smooth mixture. 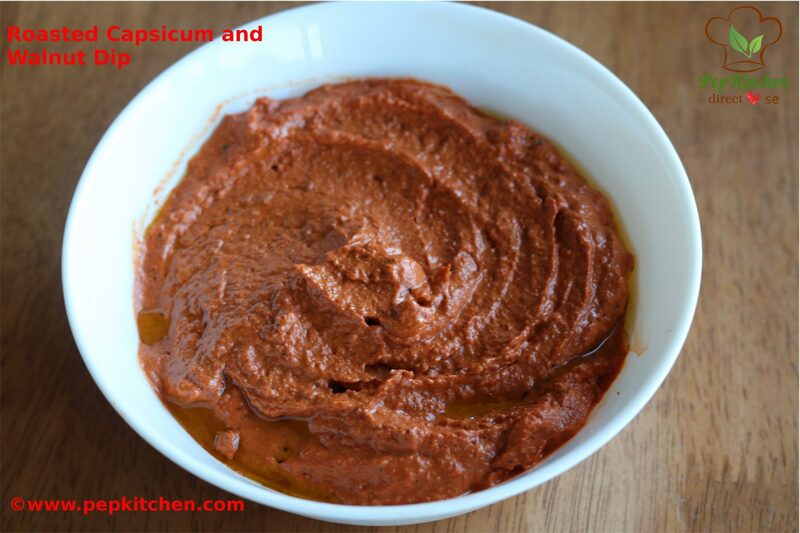 The roasted red capsicum and walnut dip is ready. Remove it in the serving bowl. 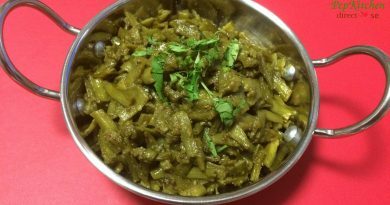 Drizzle with 1 tsp olive oil and serve with falafel, chopped veggies, pita bread or lavash.